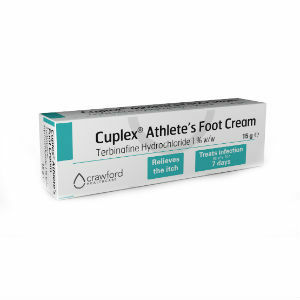 This is a review of Crawford Healthcare’s Cuplex Athlete’s Foot Cream. This cream is meant to help soothe the symptoms that often accompany athlete’s foot. Often times many of these symptoms include but are not limited to: dry and itchy skin, scaling or flaking of the skin, and also burning and/or itching. If you are wondering if this cream is meant for you and your athlete’s foot needs, please keep reading this review to find out more. The period of time during which you use this product will be dependent on how severe your infection is. However, it is recommended that the treatment should be continued for at least a week even if you think the area is already healing. This can help you avoid the recurrence of the infection. The cream should be directly applied to the affected area in a thin layer. You should then rub it in lightly. Make sure to wash your hands after application. Do not use this cream if you are allergic to the active ingredient, terbinafine hydochloride. Some side effects can include redness, stinging, or itching. If you experience severe discomfort, pain, or swelling, immediately discontinue use and contact your doctor. For 15 grams of product, you will pay £4.59 or $7.08 US dollars. There is currently no discount listed on the manufacturer’s website. There is also no suggestion of bulk purchasing or auto delivery. You can only get a refund for this product if you return it in its original package, unopened and unused. Perhaps the only benefit for this is the fact that they will provide you free postage for your return so you will not have to pay for it out of pocket. However, this means you cannot test or try the product to determine if it works for you. There are no reviews currently found on the website or online. This means we do not know whether or not this product actually does what it claimsto do and we can only go on the claims of the manufacturer. Crawford Healthcare’s Cuplex Athelet’s Foot Cream seems like a promising product. It is reasonably priced and also available with international shipping. However, there are some things which need to be pointed out. Besides the lack of customer reviews, this product has no customer satisfaction guarantee. Which means you are at risk of wasting money if this product does not work for you. For a new customer, you don’t want to spend the money on a product which may not work for you, especially since there are no customer reviews to tell you otherwise. While the product does seem solid, these determining factors give us the conclusion there are better products out there to treat your athlete’s foot condition. Jimmy Rodriguez	reviewed Crawford Healthcare Cuplex Athlete's Foot Cream	on November 19th	 and gave it a rating of 2.5.